Several grades/varieties of sulfone polymers have gained vast applicability across a number of industries in the past few years. The relatively higher level of resistance wear and corrosion provided by these materials as compared to metals have increased their usage in medical devices and implants. Owing to their high transparency resistance, low weight, and high performance, the demand for sulfone polymers is also rising in the automotive industry for use in optical reflectors, headlight bezels, fog lamp housings, oil pumps, oil pistons, and impellers. Increase in environmental awareness and shifting trend of automotive manufacturers toward low-weight materials for fuel efficiency and better performance are estimated to offer growth opportunities to the sulfone polymers market from 2016 to 2024. Transparency Market Research states that the global sulfone polymers market was valued at US$805.4 mn in 2015 and is will rise to US$1,394.7 mn in 2024, exhibiting a CAGR of 6.4% between 2016 and 2024. In terms of applications, the report examines the various applications of sulfone polymer across applications in the medical, automotive, aerospace, consumer goods, electrical and electronics, and industrial sectors. Of these, the applications of sulfone polymer across the medical sector led to the most promising returns, accounting for nearly 24% of the overall market in 2015. The segment is anticipated to continue its dominance during the forecast period as well, chiefly owing to the continuous growth in the global medical industry and the availability of vast variety of medical grade sulfone polymer product varieties in the global market. Share of segments such as automotive and aerospace are expected to exhibit moderate yet steady growth in the global market in the next few years owing to the stable rise in demand for lightweight and high-performance materials in these segments. Both the segments are expected to exhibit a nearly 6.5% CAGR over the period between 2016 and 2024. In terms of volume, North America held the dominant share of more than 39% in the global sulfone polymer market in 2015, in terms of revenue, and the trend is expected to remain strong in the next few years as well. However, the in North America, similar to the market in Europe, is projected to expand at a moderate pace during the forecast period, as the key end-use industries are well-established in these regions, with little scope for further expansion due to market stagnation. Nevertheless, the rising medical industry in the regions is expected to drive the sulfone polymer market notably by the end of the forecast period. Resurgence of the automotive market in the U.S. and healthy growth of the medical devices market is also likely to provide momentum to the sulfone polymer market in North America and Europe. 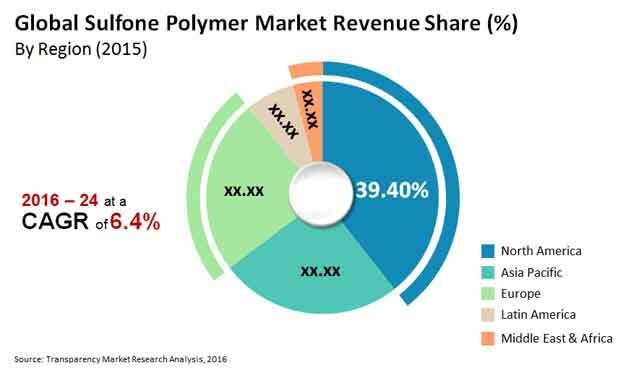 However, the overall performance of the sulfone polymer market in North America and Europe regions is expected to be less promising than the Asia Pacific market over the period between 2016 and 2024. China is projected to be one of the key consumers of sulfone polymers in the region over the said period. Other countries such as Japan, South Korea, and India are also expected to be promising markets for sulfone during the forecast period. High demand for sulfone polymers in the production of automotive, electrical and electronic components, and rise in demand for sulfone polymers in membrane manufacturing are expected to be the key factors propelling the sulfone polymers market in Asia Pacific. In the highly consolidated market for sulfone polymers, some of the key players are BASF SE, Solvay S.A., Sumitomo Chemical Co., Ltd., and Sabic. Sulfone polymers are high performance thermoplastics manufactured through the condensation polymerization process. Sulfone polymers are primarily employed in the manufacture of components which require high thermal and chemical stability such as automotive oil circuits, oil pistons and gears, medical devices such as dialyzers, nebulizers and medicals implants. Rising demand for sulfone polymers in the medical industry in various regions is likely to propel the sulfone polymer market in the near future. North America dominates the sulfone polymer market in terms of production and demand. Asia Pacific is the second largest consumer of sulfone polymer in 2015. Countries such as China, India, Japan, and South Korea are expected to be the key consumers of sulfone polymers. Expensive nature of raw materials and high processing costs are anticipated to hamper market growth of sulfone polymers during the forecast period. These factors are projected to unfavorably affect market growth during the forecast period. This report analyzes and forecasts the market for sulfone polymers at the global and regional level. The market has been forecast based on volume (Tons) and revenue (US$ Mn) from 2016 to 2024, considering 2015 as the base year. The study includes drivers and restraints of the global sulfone polymers market. It also covers impact of these drivers and restraints on demand for sulfone polymers during the forecast period. The report also highlights opportunities in the sulfone polymers market at the global and regional level. The report includes detailed value chain analysis, which provides a comprehensive view of the global sulfone polymers market. Porter’s Five Forces model for the sulfone polymers market has also been included to help understand the competitive landscape in the market. The study encompasses market attractiveness analysis, wherein end-users are benchmarked based on their market size, growth rate, and general attractiveness. The study provides a decisive view of the global sulfone polymers market by segmenting it in terms of product type (PSU, PESU, and PPSU) and applications such as medical, automotive, aerospace, consumer goods, electrical & electronics, industrial and other (including membrane, military, plumbing, etc). These segments have been analyzed based on present and future trends. Regional segmentation includes current and forecast demand for sulfone polymers in North America, Europe, Asia Pacific, Latin America, and Middle East & Africa. The report provides the actual market size of sulfone polymers for 2015 and estimated market size for 2016 with forecast for the next eight years. The global market size of sulfone polymers has been provided in terms of volume and revenue. Market volume has been defined in tons, while market revenue is in US$ Mn. Market numbers have been estimated based on product type and key applications of sulfone polymers. Market size and forecast for numerous end-users have been provided in terms of global, regional, and country level markets. Secondary research sources that are typically referred to include, but are not limited to company websites, annual reports, financial reports, broker reports, investor presentations, SEC filings, Plastemart magazine, BP magazine, internal and external proprietary databases, and relevant patent and regulatory databases such as ICIS, Hoover’s, oneSOURCE, Factiva and Bloomberg, national government documents, statistical databases, trade journals, market reports, news articles, press releases, and webcasts specific to companies operating in the market. The report comprises profiles of major companies operating in the global sulfone polymers market. The global sulfone polymer market is consolidated. Key players include BASF SE, Solvay S.A., Sumitomo Chemical Co., Ltd., and Sabic. Market players have been profiled in terms of attributes such as company overview, financial overview, business strategies, and recent developments.